Unless you count the odd interminable tie-in novel seemingly written as an exercise in seeing how many words you can cram in before having to deal with any actual plot, when we last saw the jolly dinosaur-hunting crew of the Anomaly Research Centre, they were mourning the loss of TV's 'Bland Bloke' (so that's five more people missing him than you'll find amongst the actual audience, then), while time-hopping madwoman Helen Cutter hinted from his graveside at some dark plot with equally dark consequences which had something to do with multiple instances of the same identical annoying-faced henchman. It looked as though this was the set-up for some major forthcoming shenanigans, which made it all the more startling that the series that followed promptly changed direction completely. Within a couple of episodes we'd lost a couple of major characters (and the annoying-faced henchman), and gained about seven million more in their place, while several long-standing plot devices were binned without the slightest hint of resolution, and nobody even so much as mentioned their erstwhile bland anomaly-scouting chum. It's difficult to say whether this sudden volte-face had been planned all along - the first couple of episodes in particular had a good deal going on that was more or less jettisoned in the space of a scene or two, suggesting that there may have been a sudden creative decision to indulge in a spot of deck-clearing - but the whys and wherefores of the reshaping of the show are a matter for DVD commentaries and agitated Wikipedia editors. What's more important to look at here is whether or not this exercise in deck-clearing re shapement has brought any benefits to a show that, let's face it, was working just fine as it was. 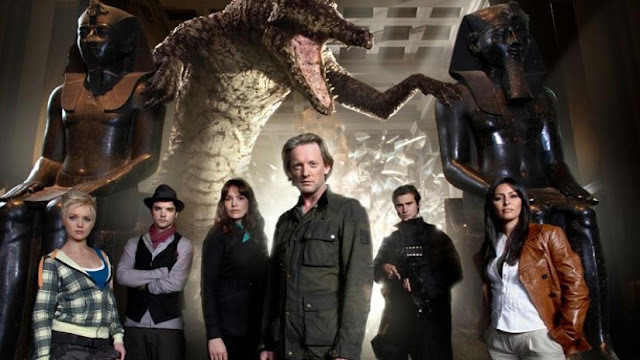 The most obvious and immediate difference even to casual viewers of Primeval is in the regular cast, now almost un -recognisable from that original four-strong outfit who stared out at you from massive billboards while wearing a lot of pale green. The decision to kill off Nick Cutter was a daring one, particularly given Douglas Henshall's profile and the age and sensitivity of the target audience, but was also ultimately a sensible one, at least in dramatic terms. As a character, he's always been the weak link (even in a line-up that included 'Bland Bloke'), lacking any real drive and purpose beyond grief-stricken infatuation with a woman who doesn't exist any more and being a bit narky at those inconsiderate dinosaurs who wandered into our timeframe without asking his permission first. His position as the undisputed team leader who considered himself an intellectual cut above his compatriots also meant that he got the lion's share of screen time, despite usually having the least interesting perspective on and lest interesting involvement with the unfolding events - again, no mean feat when you spend most of said screen time standing next to 'Bland Bloke' - and his departure has allowed some of the others a long-overdue opportunity to shine. Jenny Lewis, on the other hand, was written out for no good reason and with the lingering mystery of her chronological DNA-fused intertangling with the vanished Claudia Brown (presumably also permanently gone by association, and probably off somewhere drowning her sorrows with the similarly 'whoops, can't find a way out of that one'-afflicted Caitlin from Heroes) left frustratingly unresolved, unless we're supposed to count that mumbling about Cutter being in love with her but not with her or whatever it was. Though we do get a bit more Ben Miller as a result, and that's always a good thing, the show is poorer for her absence. So do the replacements in any way make up for the Jenny-depletion-related shortfall? The answer, happily, is yes. Danny Quinn, despite originally being given a rather awkward and unconvincing 'motive' for his interest in the dinosaur incursions, works brilliantly as a leader who is just high on the thrill of sending the reptilian interlopers packing back to their own era and the ensuing satisfaction of a job well done. His unashamedly impulsive streak allows him to go about his business in subterfuge-friendly ways that Cutter would never have sanctioned, usually with amusingly unsuccessful consequences, and his regarding the rest of the team as equals rather than assistants allows for more sturdy plotlines and action set pieces, though it must be said that this also makes the Connor Is Stupid gags and Abby Is A Damsel In Distress gambits look increasingly out of place. Captain Becker - no first name as yet, apparently - is another great addition, with his clipped and unflappable military attitude to proceedings evoking the spirit of UNIT in early seventies Doctor Who, as opposed to the one-dimensional over-reactors who had temporarily (due to their tendency to be killed by dinosaurs) occupied the military character slots in previous series. Less convincing is Sarah Page, who comes across as a sort of light weight cross between Abby, Connor and Jenny, and doesn't really seem to be given very much to do apart from rather implausibly wander into the middle ages in a fancy dress costume in search of historical clues, and furrow her brow over an 'artefact' that wasn't given as much exposition as perhaps it should have been. Major cast changes are always going to happen in any long-running show that runs for long enough, though. What's more interesting is the way in which the production team have attempted to expand the show's format this time around, diversifying from the previously strict 'prehistoric predators are in YOUR shopping mall' template and using the concept of anomalies to explore such areas as myths and legends, unsolved murders, and scientific projects that went horribly yet inexplicably wrong. The arrival of an unstoppable flesh-eating fungus from the future made for a particularly strong episode, even if the climactic 'Fungus Man' effect did seem a little there for the sake of it, and similarly both impressively realised and refreshingly different were the encounter with an Ancient Egyptian 'deity', and the anomaly-instigated mysterious deaths of some Oasis-inspired teenage boys attempting to get 'mad for it' in a derelict house (though someone really ought to have looked at a couple of photos of what people might have worn in 1995). Less successful was the tale of a dragon-seeking knight accidentally transported into the present, which should have been a great excuse to do 'funny', or even 'funny' abruptly shifting into terror as in the superb first series episode about the dodo parasites, but curiously avoided any sort of Les Visiteurs-style comic romping in favour of a lot of time-straddling angstiness and the odd bit of shouting at Connor for being a perfumed dandy. On the more conventional side, the hospital brought to its knees by rampaging Diictodon was a thrilling example of what Primeval has always done best, and the sinister, claustrophobic episode set in an abandoned wartime research centre, with its skilful use of sound and contrasting eerie silence, was about as chilling as Saturday evening television gets- all the more amusing when you consider that the futile, hopeless desperation in the evidence left behind by the researchers of the past was haunting enough to unnerve even adult viewers. Lord knows how many children had Primeval-related nightmares that day. That particular episode, with its clear allusions to the plot of The Evil Dead (even down to the presence of a spooky gramophone - and it wasn't the only episode to pay 'homage' towards Sam Raimi's erstwhile Video Nasty, either), is indicative of another welcome trend in the revamped Primeval, experimenting with the influence of other shows and films and trying to do something new and, well, a bit dinosaur-y with them. Though for all the subtle touches of Stargate, 28 Days Later and what have you, there was one apparent influence that was adopted perhaps a little too enthusiastically. Within the first couple of episodes we'd encountered a 'string map' of time, a rival research centre with a sinister agenda, a long-haired Asian bloke who'd got too close to the truth, and an ambiguous villain trying to prevent a 'dark' future from happening, all of which were more or less dropped abruptly when someone presumably realised that perhaps Heroes wasn't the most sensible choice of show to be slavishly emulating right at the moment. Presumably less intentional a reference was the creature that looked like Harry Hill's puppet cat Stouffer and sounded like nineties 'slacker' cartoon icon Beavis, though thankfully that spent most of its time off-screen. More intentional, and enjoyably subtle, comedy was provided by the reluctant flat share situation of Connor and Lester - more the sort of context in which jokes about ham-fisted clumsiness work, rather than scientific scenarios where they often just seem jarring - though the less said about Abby's mercifully little-seen brother and his attempts to sell Rex on eBay, the better. So, a big thumbs-up all round, or whatever it is that dinosaurs have instead of thumbs, for the brand spanking new incarnation of Primeval. Except, that is, for the last three episodes. Earlier in the series there had already been a frustrating and atmosphere-stifling trend towards shifting the action into deserted areas and behind closed doors wherever possible, which kind of misses the point that what the majority of the audience really want to see is big lumbering lizards smashing through country houses, and the closing trilogy perhaps pushed this a little too far. Desperate to prevent a cataclysmic introduction of predators they may have been, but most of the action took place either in a human-less future or a human-less past, both of them irritatingly light on creature attacks too, eradicating a good deal of the edge-of-the-seat tension that any self-respecting series closer should have. 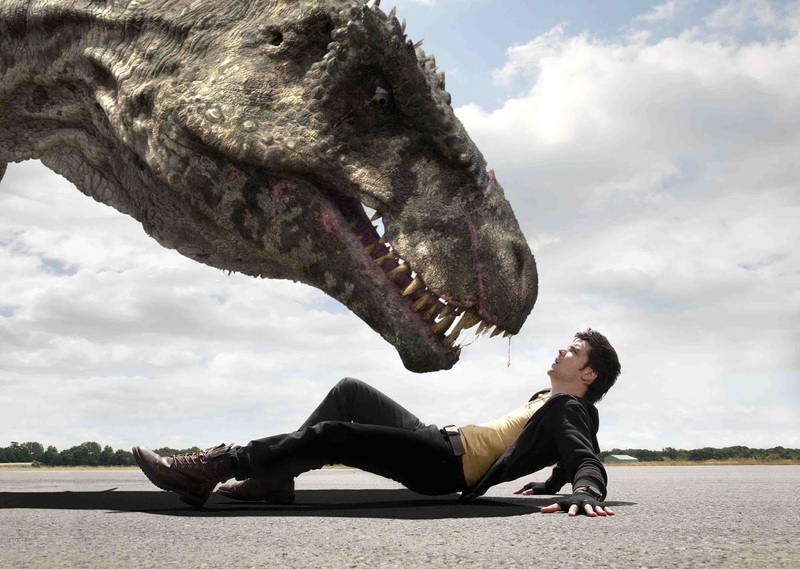 The decision to interrupt the series for a week to allow for the extended final of Britain's Got Talent didn't exactly help matters much either, and to add insult to injury, Diversity didn't even formation dance into a 'dinosaur' shape to make up for its absence. Added to this there was the sudden and puzzling change in Helen's game plan from wanting to prevent the catastrophe to simply wanting to wipe out mankind full stop (and, if the human race had been wiped out by an imminent error of judgement at the ARC, where exactly did she get the advanced technology allowing her to control anomalies and change her physical appearance from, then? ), the ensuing pointless wasting of a great villain, and the rather poor 'oh, there were some other missing links in that valley over there all along!' get-out at the end. The decision to close on a multiple cliffhanger rather than a setup for a new story was also perhaps not the wisest of moves at a time when ITV are slashing budgets left, right and centre; despite what some appear to think, this is no way of guaranteeing a show's safety from the over-active pens of frowning 'suits'. If you want evidence of this, ask anyone who spent far too many Saturday evenings wondering if they'd ever find out if Will and Beanpole managed to find the Freemen's new base. That's not to say that the final three episodes were anything less than barnstorming, blockbusting Saturday evening entertainment exactly as it should be, just that they fell a little flat in the context of a series that has brilliantly and effectively shaken itself up and has done a sterling job of finding a new way to match the unrecapturable, bolt-from-the-blue impact of the first series. 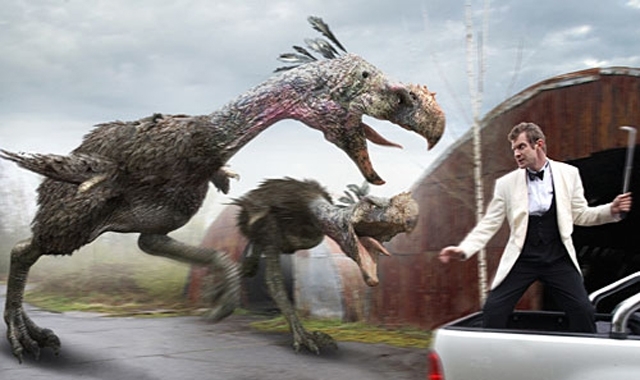 Providing the evolutionary throwback that is the current ITV regime can be persuaded not to cancel one of their biggest shows for the sake of juggling a few subtotals - and, worryingly, there's nothing to guarantee any of their output is safe from this at the time of writing - Primeval should be safe from extinction for a good while yet.